This comic was drawn in anticipation of a long drive I made this week from Kansas City to Denver. I think Kansas was mad at me, because I had to navigate my Honda through a snow and ice storm that spanned the entire state. However, the terrible weather did make the trip anything but boring. Grant, I saw this one in the KC Star and followed it here. Excellent artwork! I'm actually doing that exact drive this summer, though I'm coming from Oregon. It's a long journey, but from the border to KC is really quite maddening. On the subject of Kansas bodies of water: I remember going fishing in Scotts Lake with my uncles and pulling up a catfish that truly did look mutated. No one else would touch it so I finally stepped up and got it off the hook. Its skin felt like mucous. Thank you for capturing the intense desolation that is Kansas. I've never been, but Kansas sound verrrry intriguing. Dude, first, I love your comics. Found them on Reddit. And second, the drive across Kansas is long and arduous. Did St Louis to Denver via I-70 two years ago and hallucinated for at least half of it. The never ending horizon of fields is indeed strangely zen-like. HAHAHAHA, I love this one, I used to live in and around wichita. Eastern Kansas isn't as bad, you at least have the Flint Hills, those have some pretty scenery (sometimes). But whenever I had to take trips to New Mexico or Colorado, I usually brought a pillow and made whoever was riding with me drive (provided the poor sucker didn't know about the boring drive, then we had to paper, rock, scissors for shotgun. My father in-law lives in Denver, so we make this drive often. I think you are remiss to leave out Prairie Dog town and the two-headed calf, though! I still have nightmares about driving through Kansas on my way to Colorado. The entire bus broke into cheers when we spotted a single tree on the horizon. This is great :) haha he got bored ^.^ i enjoy your work. Love this! So funny...because it's so true. I-70 goes through the worst part of the state. Drop down and take US 50 and there's a bit more to see. I used to live in KC and moved to Denver a little less than 2 years ago--I'm well familiar with this drive! Great comic! Very true! I live in Leavenworth. The past few weeks have been crazy. One day it snows 5 inches and the next its 40-50 degrees. I'm looking forward to the summer now! every comic strip you come up with hits many different feelings. humor, politcs, or just seriousness. awesome! 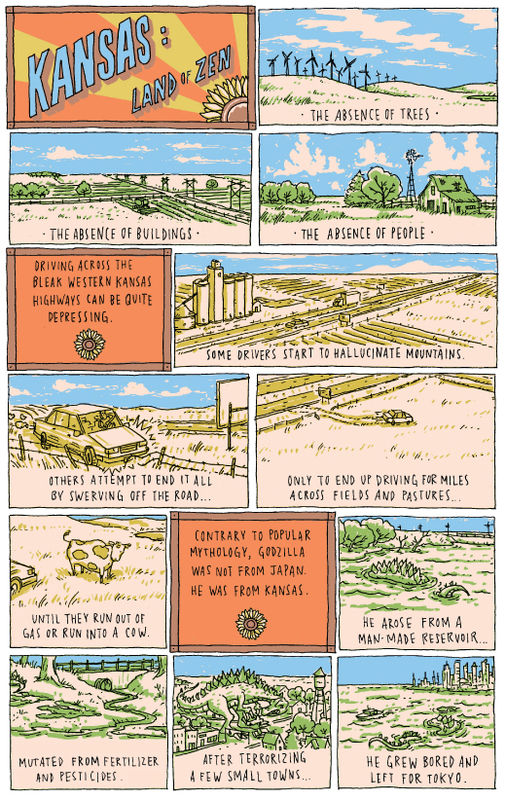 Sounds a lot like driving through Illinois N. to S.; nothing but cornfields S. of Chicago. I've been this route a couple of times. You aren't exaggerating the boring nature of west Kansas. It is so boring that after the first family round-trip from CO to IL, we subsequently always went the I-80 route through Nebraska. It was more interesting. This is why you're supposed to FLY to Denver. I feel your pain and laughed my a%% off at this cartoon as I just returned from a drive to AND from Dodge City, KS. The hallucination of mountains is REAL. I love this. I do a bit of driving trips and this comic cracked me up. Great.